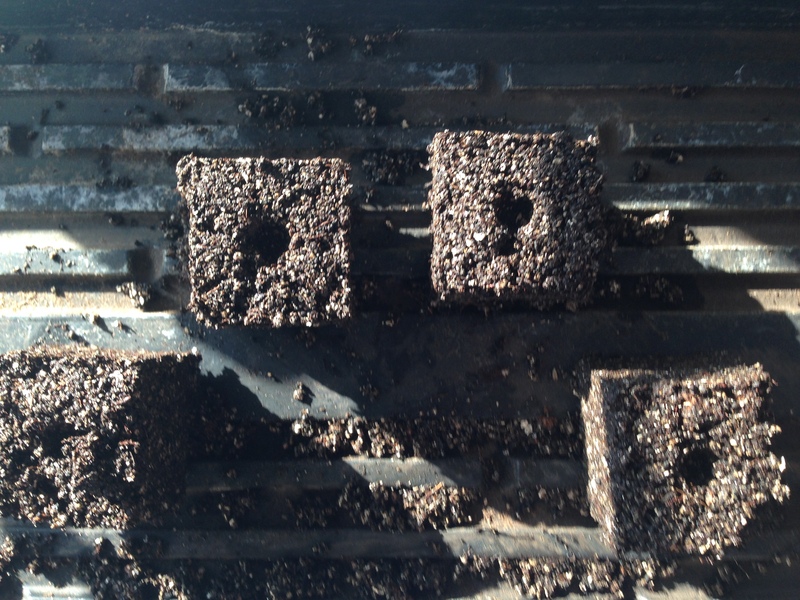 So this year I’ve been doing soil blocks for my seed starting. First off if you ever get a chance to soil block – I’d recommend it. For those of you who actually ready this and don’t know what that is – soil block is a technique small farms use to “block” or form together a custom soil mix usually compromised of a few or many organic matter/nutrients. Predominantly made up of peat moss, it’s the binder, it ends up being very similar to peat pods(netted peat) and better yet will decompose in your garden. Although the peat pots claim the net is “biodegradable” I’ve def found them year after year in my gardens and I don’t appreciate it. So now I soil block. And I love it! As the plants grow I can see their health as roots form out of the sides and bottoms. It’s such an interesting technique and far better than using pods, plastics, and having to continually transplant into bigger planters. But during my moments of soil block I had that “ah ha” moment of why we need so many chemicals to control plants and their vigor and health. We are growing them up to be pansies. Essentially what I mean is we give them these pristine environments such as perfects soils, temperature controlled, available water and we don’t let them work for their lives. Then we throw them out into nature and all the sudden it’s “make it or break it day” when growing. So we throw chemicals and sprays to defend its pour immune system because up until now it has not been tested. We as humans are doing a very similar thing to our kids. We now shelter them to never get sick and pump them full of meds and never let their immune system learn and recover. It’s all about patch work when it comes to our immune system. Ah – so that was my two cents after awhile. Growing is going awesome and I am very excited for the 2015 season and going bigger this year and showcasing how great gardening can be. What are your growing now? What am I growing now? Well, next to nothing. Although once the farm is up and running there are many techniques one can employ to grow year round crops. We’re just not there yet but we hope to one day! What I am growing is my knowledge by reading books. Each book has some tidbit of info I’ve never heard of or trick I want to try. Each book carries unique techniques from that person and farm! But most of all I reflect on my own growing skills and what I will change next year for growing and sowing. So what am I growing – knowledge. I can tackle next season well before it starts and really set a good plan in place to produce the most of in the most organic way. What would I change about my 2014 season? Lets start with the hardware. I had a poly cover over my beds which I won’t do again. Unless you are completely closed system which temp, humidity, and air flow regulation I don’t recommend the purchase. At best it kept the rain off and thats about it. Row Covers per bed will be practiced. You’ve seen row covers you just don’t know it. They are white and long across farms. Up close they are lightweight, air and water permeable, and pest resistant. Depending on the thickness it does help with temps going up and down at night and some even can protect from frost. So I look forward to employing row covers next year! More skinny beds. I left a lot of dead space and I feel that is because my beds are 4 feet wide! This poses a problem if I want to plant or harvest anything in the middle so I will construct 2 foot wide beds that can be easily jumped or stepped over and just plain reached over. I’d suggest never creating raised beds you can’t reach all the way across so the length of your arm is a good rule to go by. Next year I will be incorporating more flowers as pollinators and also to attract beneficial insects. I may even put in a bat house. Buy the right tools not the cheap tools. I took more tools and things back because the product was terrible. I’ve learned now that expensive means quality and consistency. I don’t mind paying hundreds of dollars if it saves me time and trouble! I’ve got to think long-term about tools. You can’t use things for one season – you’ll never get your money out of it. I need products to last for 5 years minimum or more. Get things done when you can not tomorrow. Come fall time in the Northern Michigan sunny days are few and far between and so are dry ones. You don’t want to be caught trying to finish out projects in 40 degree weather raining and windy especially it that is trying to mulch leaves! If it can be done – do it. Next year will be different. I am moving to be a better location and will have my garden right out by back door and plan to grow and show the world how fun and easy gardening can be regardless of time, effort, money, and what not. I just want to show you it is possible to have fresh, whole, unsprayed, un-altered food just steps away.